To persist Map of embeddable keys and basic types values, the annotation @ElementCollection is used on the map field/property. The Entity and the Map are mapped to two separate foreign/primary-key tables. One for the entity and other table (join table) for embeddable fields/properties (as map key) along with a single column for the map value. The Map table has the foreign key pointing to the primary key of the entity. Also all columns corresponding to the embeddable fields/properties will have primary key constraint. This is similar to mapping a Map of basic type keys and @Embeddable values, the only difference is the map key is mapped to multiple columns (depending on number of embeddable fields) instead of just one in this case. In this case the embeddable class must implement the hashCode and equals methods (a general requirement for map keys). By default, JPA naming conventions are used for the mapping. We can customize that by using @JoinTable and/or @Column annotations. This is a very simple example with default table/columns mapping. At the end we will see more examples. h2 1.4.194: H2 Database Engine. To customize map with embeddable keys mapping, we can use @CollectionTable to customize the join table with @CollectionTable. 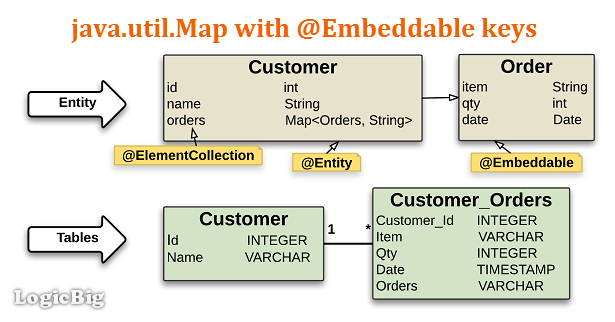 The column which maps to the map values (in the join table) can be customized by using @Column. Note that @MapKeyColumn has not effect, because there's no single column which points to the map key.